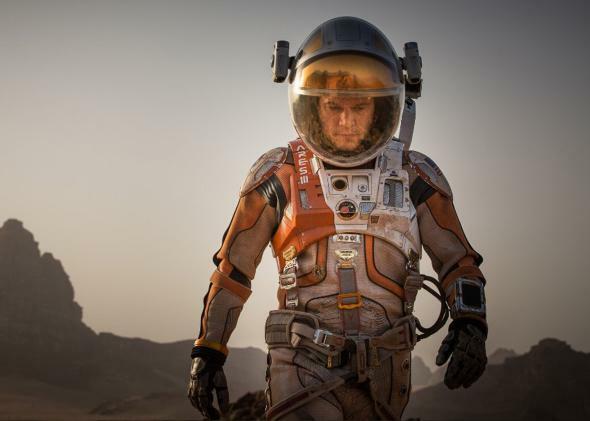 Ridley Scott’s The Martian film: Science worship and the scientist as hero. The movie shows how Americans fundamentally misunderstand science—and that’s OK.
To Americans, scientists represent a formidable form of authority, wielding the natural laws of the universe to answer the most pressing questions of the day: From whence does man originate? How far does the universe extend? Should I bring my umbrella tomorrow? But The Martian, an adaptation of Andy Weir’s novel by the same name, doesn’t just love science: It worships it. In doing so, the film risks painting science as a kind of magic—and scientists, by extension, as wizards. Let’s start with Watney. He isn’t a Navy SEAL or otherwise a traditional tough guy—he’s a botanist. He uses this unusual superpower to his utmost advantage, as when he realizes in a stroke of botany-related genius that he can grow his own food using the real potatoes NASA had spent precious cargo space on for the crew’s Thanksgiving dinners. Later, this paragon of rationality uses his knowledge of chemistry to distill water and oxygen using hydrolysis; comes up with a way to communicate with NASA back on Earth; and figures out how to jerry-rig a makeshift heater for his Mars rover out of a buried plutonium power source. No matter what problem Mars throws at Watney, he can solve it—armed with his trusty sidekick, science. Screenwriter Drew Goddard has called the film a “spiritual movie,” in which the religion being worshipped just happens to be science. So it makes sense that its scientists are practically deities. They are problem-solvers, survivors, doers; they grow gardens, create codes, make bombs. Consider a key scene in the movie, when a plan to rescue Watney fails. But hark! Rich Purnell (Donald Glover), a disheveled NASA astrophysicist, swiftly comes up with another plan—one involving a slingshot maneuver and some complex equations. The film doesn’t explain how Purnell came to this conclusion. It doesn’t explain why anybody should believe him. He just downs a carafe of coffee and it comes to him in a stroke of divine inspiration. Sci-fi films don’t always represent technology and science as such definitive forces of good and progress. In Alien, an android decides Ripley must die because she has endangered the mission of bringing back an alien life form; in 2001: A Space Odyssey, the sentient computer HAL decides to kill the ship’s entire crew to alleviate a conflict in his orders; in I, Robot, murderous robots turn against humanity just as we have become completely dependent on them for our survival. In all these films, science becomes the enemy. In The Martian, science isn’t our nemesis, but our trusty companion, our secret weapon, a force for good. It is the hatchet (and The Martian is the Hatchet) of the 21st century—an emblem of human ingenuity, progress, and resourcefulness. “The implication here is that it’s comforting to think that, in a crisis, a scientist will sweep in and save the day—whether that crisis results from a real problem like climate change or a deadly pandemic, or a fictional one, like being stranded on Mars,” says Lawrence. “It shows how persuasive the promise of science can be.” Is it completely accurate? Maybe not. But I’ll take that attitude over technophobia any day.